1 of 4 Heat oven to 350 degrees . Butter and flour a 9 x 9-inch baking pan. In a bowl, mix 1 cup of the flour, the cornmeal, baking powder and salt. In a separate bowl, whisk sugar, milk, butter and eggs. Fold dry mixture into wet mixture until just combined. 2 of 4 Toss blackberries with remaining 1 tbsp flour. Gently fold into batter. Transfer to baking pan, using a spatula to smooth the top. Sprinkle with turbinado sugar, if using. 3 of 4 Bake at 350 degrees for 40 to 45 minutes, until a toothpick inserted in center of cake comes out clean. Place on a wire rack and immediately run a paring knife around edge of cake. Cool 20 minutes. 4 of 4 Whisk heavy cream and honey in a bowl until stiff peaks form. 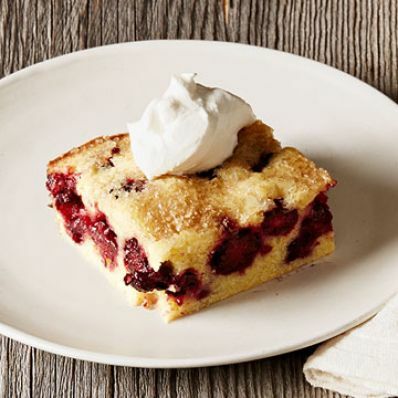 Serve cake warm or at room temperature with whipped cream. Per Serving: 260 mg sodium, 12 g sat. fat, 4 g carb., 3 g fiber, 5 g pro., 350 kcal cal., 20 g Fat, total, 100 mg chol.